for the August Release at Peachy Keen Stamps! I created this cute kitty card using the new Stamp of the Month set. It will be available for sale, along with the rest of the release on Monday, August 5th. 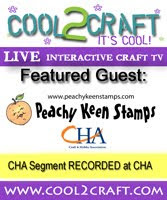 Stop by the Peachy Keen Stamps Blog each evening until then for more great peeks from my fellow DT sisters! They are so awesome!! We're having a Release Party on Monday at 6 p.m. over on The Peachy Keen Connection, and I hope you'll be able to join us for that, too! Chatting, sharing, games, challenges and LOTS of fun await! The images were colored with Copic markers, and the grass was created with The Grass Border Cottage Cutz Die from The Scrapping Cottage. The paper is some that I've had in my stash for a long time. Sorry! I'm not sure who made it, but it's a whole pad of paper dealing with puppies and kitties. Love it!! This new release will go live on The Peachy Keen Stamps website on August 5th at 7 p.m. CDT! I'm sure there will be a great sale on all the new merchandise, so get your wish list ready! looking forward to receiving the new SOTM!!!! So cute! That is such a great "cat pose" in the grass. Adorable! You always create the most wonderful cards!! Miss seeing you on SOTC!! HUGS!!! *Sigh*. How delightful is this card Lorie! You pull the rabbit out of the hat every time don't you! This is another example of your amazing skill at colouring and creating the most wonderful of scenes. Great coloring my friend! Love your CUTE card!